Windham-Ashland-Jewett’s (WAJ) science club, organized by Deb Valerio, embraces another year of fieldtrips funded by the Windham Foundation. The science club is offered enriching educational fun through Cornell Cooperative Extension of Columbia and Greene Counties. Each month the club can visit The Agroforestry Resource Center and The Siuslaw Model Forest to explore and reflect on the forest ecosystem. The club’s first session offered youth a chance to brainstorm about insects, explore the benefits of compost and hunt through the forest in search of six legged critters with environmental educator, Andrew Randazzo. As flying insect populations continue to experience drastic decline, there’s never been a more important time for young people to develop an understanding of the many roles insects play in an ecosystem. 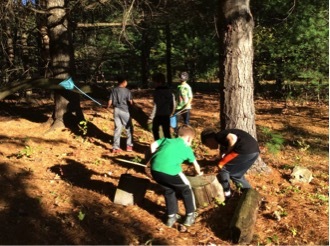 This session students were able to develop a hands-on understanding of decomposition and natural cycles while gaining beneficial exposure to the outdoors. As the school year moves forward club participants will be able to further their knowledge as they explore many more topics such as stream ecology and dendrochronology.